Thread: Ma Long Mimics Fan Zhendong's Around The Net In Rio! 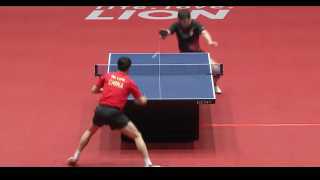 Last month Fan Zhendong's incredible under the table around the net roller went viral due to its formidable skill level and difficultly! Even main stream media including Sports Bible, BBC and USAToday picked up the remarkable shot. When Ma Long met Quadri Aruna in the team event at the Rio Olympics this week the Olympic Champion did a very similar shot! It takes extraordinary touch to pull this off! Check it out below via Instagram! What a great Table Tennis Roller Shot! Another extraordinary touch by Ma Long to pull off this roller at the Olympic Rio 2016 like ?#?ITTFWorldTour? Japan Open by Fan Zhendong . #Rio2016 #OlympicChampion #Olympic #champion #??? #?? #?? #Ittf #tabletennisdaily #TableTennis #tabletennisplayer #tischtennis #pingpong #ping_pong #chinese #china #chinesetabletennis #LoveTableTennis #MaLong #Ma_Long #?? #?? Who's shot did you prefer? They sure are similar! FZD's shot is definitely the finest out of these two. What was similar about these two shots was the situation ML and FZD got in. But look at the opponent - Gauzy and Aruna had their rackets around the same place when the chinese began the execution of the shots. FZD's shot managed to actually roll on the table with no less than 3 times hitting the table, while ML's one was higher and I think it was possible to return that one. Anyway, this doesn't make ML's shot a bad or easy one to execute, but FZD's roller was definitely better. I'd like to see some one return that shot of Ma Long's.they would have to be Gods. Both are awesome shots. Aruna's ball goes wider so Ma Long has a clear shot around the net. Gauzy's shot is too close to the table to go around the net. FZD goes under the net. There is a much smaller margin for error in that shot. So it is definitely harder to make. That being said, they are both great reactions and perfect shots for each specific situation. So, in some sense, they both are the best.